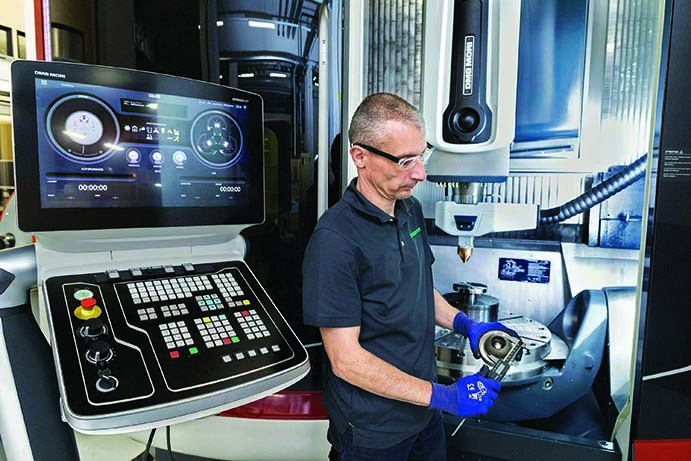 The 21st century watchword for production equipment has been multitasking and machine tool builders such as DMG Mori have continued to push the capability envelope. The company’s latest offerings include the possibility of milling, turning and grinding in a single set-up on its Duoblock FD series of 5-axis mill-turn centres. The addition of grinding on the same platform should attract manufacturers wishing to exploit single set-up potential for preserving dimensional accuracy, while enjoying the levels of surface finish achievable with grinding. Sizes 80, 125 and 160 in the Duoblock FD series can be equipped in this way. Technology cycles in the machine control for internal, external and face grinding support the processes and there is a specific cycle for calibration of the grinding wheel truing station. A similar philosophy, incidentally, is evident in the company’s Lasertec 65 3D hybrid machine, currently employed on a collaborative project with roller bearing specialist Schaeffler (brands include INA and FAG). The machine is being used to produce one-offs and small batches. The one-hit process combines the flexibility of additive manufacturing, with 5-axis milling. Schaeffler is of course a leading high technology company – it was, for example, already using 3D printing for prototypes, fixtures and small series production. But familiarity with new technologies is an important consideration for manufacturing companies of all sizes, especially at the operator level. With this in mind Heller has introduced an advanced training machine designed to raise the skill level of horizontal machining centre operators away from the shop floor. The CNC ProfiTrainer builds on the capabilities of an existing 4-axis version with rotary table by offering the option of an additional A-axis. Designed to tolerate operating errors, it provides skills training without tying up a machine on the shop floor, or risking a crash on a ‘real’ machine. Meeting the needs of customers starting out in 5-axis work – alongside those already well versed in the technology – drove XYZ’s introduction of a full simultaneous 5-axis, gantry-style machining centre with a trunnion table machining centre to its range. A key design feature is that when the table is tilted 90° towards the rear (component facing forward), there remains 500mm of Y-axis travel forward of the table surface. This, says the company, is much greater than many competitor machines, including those that quote the same axis travels, allowing larger workpieces to be machined. 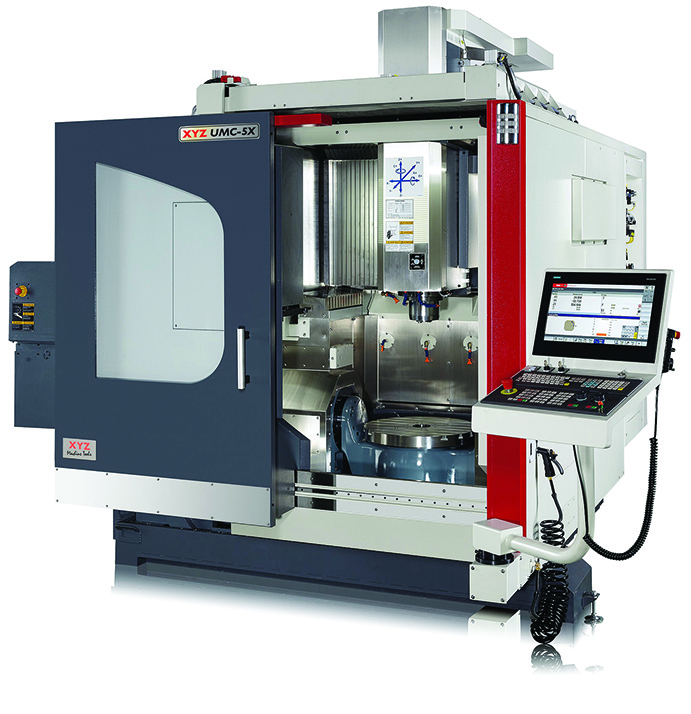 Established builders and suppliers continue to launch new or enhanced 5-axis machining centres. 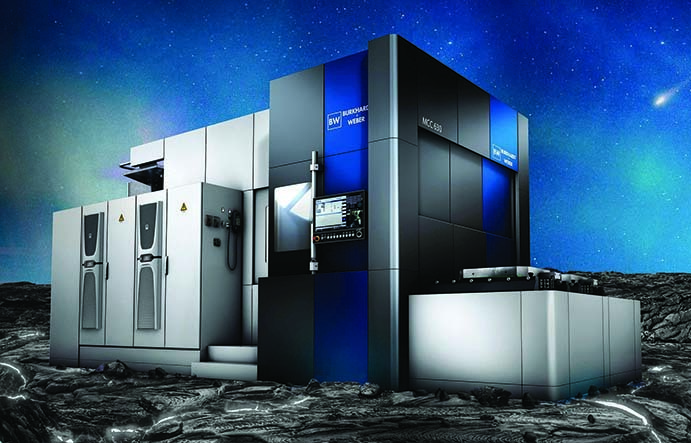 Makino’s new a500Z horizontal, with a working volume of 730 x 750 x 700mm, features a highly rigid structure and low inertia, providing production efficiency similar to a 4-axis machine. One-piece bed casting, slant-bed and three-point support constitute a design which focuses on stiffness and stability, while the innovative swivelling table has minimal overhang to enhance rigidity. Regarding temperature control, the a500Z combines a thermally symmetrical structure with effective heat removal from the spindle, core-cooled ballscrews and motors to ensure machining accuracy during long hours of operation. Direct-drive motors on the rotary axes are fitted with cooling jackets to suppress heat generation. High productivity means that coolant and chip management are significant issues. To deal with this, unlike the conventional 5-axis trunnion table set-up, the a500Z has a wide trough located beneath the table. Coolant flow from a comprehensive washing system that encompasses the pallet loading area prevents chips accumulating by ensuring that they fall directly into the trough. Chip disposal was also a serious consideration in the design of the new VC1650 5-axis machine from Spinner. Four spiral augers deliver chips to a conveyor at the front of the machine for convenient removal. This also ensures negligible heat transmission and allows space on the shop floor to be saved when installing the 16-tonne machine. In addition a single wiper system, eliminating the need for a telescopic cover, protects the Y-axis guideway from swarf and coolant ingress (the depth of the machine is thus shorter, bringing a 30 per cent reduction in overall footprint). Meanwhile Burkhardt + Weber’s new MCC 630 is claimed to be one of the most rigid and powerful metal-cutting centres in its class for producing prismatic components weighing up to 1.5 tonnes. A 4-axis machine, there’s an option of a +45°/-110° tilting spindle to add a fifth CNC axis. The single-piece bed casting allows rapid installation and commissioning, either as a stand-alone machine or as part of a line. The practical matter of how to fit new machines into existing production facilities with space or access limitation can’t be overlooked. For Coventry-based small-batch sub-contractor Overstone Engineering, the factory entrance was actually the main issue when choosing a 3-axis VMC, as the door lintel is only 2.2 metres from the ground. This prompted selection of a Hurco VM5i which is under 2m tall with the ram lowered, and has a compact footprint of slightly over 1.6 x 2.2m. Selecting the right cutting tools to match a wide range range of workpiece materials and component specification is a critical part of process design, and it’s an issue that faces specialist SMEs such as Yeovil-based Talon Engineering. The company mainly serves the off-road motorcycle industry, and has worked on a number of high-profile projects, such as the Ariel Ace motorcycle. It is now undertaking a new range of parts as Ariel develops its Hipercar (described as an ultra-high performance, range extended, electric sports car). All mechanical components must be machined to high standards, incorporating Ariel’s own idiosyncrasies. The pace of such projects requires cutting tools to be on the machine at short notice. Working with WNT (UK) Talon has developed a standard list of tooling, including HPC cutters, Type W Alu line cutters, as well as making major use of WNT’s Centro P toolholding system. Most of the cutting tools are held in WNT Vending machines, which can hold up to three months of stock, ensuring availability around the clock. In some respects the complex work that Talon is producing for Ariel appears to be suited to 5-axis machining, but Talon has taken the decision to maximise its 3-axis vertical machining centres. The components being machined include wishbones, accelerator and brake pedals and assemblies, handbrake and chassis brackets, most requiring significant 3D milling. Unusually, Ariel requires feed marks to be visible and, in some cases, corner radii machined to resemble welds, leading to some complex programming. As part of this project, Talon has adopted new machining techniques with the support of WNT, with trochoidal milling being the way forward for much of the machining undertaken. “As this project moves forward into production trochoidal milling will bring further advantages as it reduces the stress and pressure on machine spindles,” says process engineer Sam Chinn. In the wider, high volume, automotive sector, any advantage on machining of components will return significant dividends. Around 50 million turbo chargers are produced worldwide annually. These parts must withstand temperatures of 1300°C in service, and productive face milling can be a challenge due to abrasive stainless steel or cast-iron workpiece materials. In addition, the complex shape of these thin-walled components makes for intricate clamping and a process that is highly susceptible to vibration. Sandvik’s new M612 indexable insert face milling cutter is designed especially for this purpose. The positive geometry and edge line quality of the M612 provides a smooth cutting action that helps to reduce power consumption and eliminate vibration. This permits higher metal removal rates and quicker cycle times, which, in combination with 12 cutting edges, contributes to lower cost per part. The choice of round inserts also adds flexibility for machine shops in terms of the material types that can be processed and the milling operations performed, while the highly secure insert indexation interface delivers both accuracy and repeatability. Finally, on a more specialised note – but one which nevertheless acknowledges the need to tackle an ever-widening range of workpiece materials – the new DCG thread milling system has been developed by Horn for producing M1 to M2.5 metric ISO threads DIN 13-20. The solid carbide, single-row, coated milling cutters, which have extremely sharp edges and are suitable for universal use, are available as standard for producing a thread length up to 2 x D. They demonstrate their special capabilities and efficiency when machining steels, stainless steels, cast iron, non-ferrous metals and in particular hard-to-cut materials.